Highlighting the Supreme Court clean chit to the Government in the Rafale deal, Prime Minister on Sunday unleashed a vicious attack on the Congress from the home turf of its supreme leader, Sonia Gandhi, and hurled corruption charges against the grand old party in defence purchases making stinging jibes like the absence of “Quattrocchi uncle” or Christian Michel in the BJP Government’s defence procurement. The Prime Minister also accused the Congress of trying to malign and influence judiciary. The Prime Minister was making his first public speech after the Supreme Court gave a clean chit to the BJP Government in Rafale deal and BJP lost the three Hindi heartland States of Rajasthan, Madhya Pradesh and Chhattisgarh to the Congress. Claiming that country will never forgive the Congress for attempting to weaken the Army, Modi said the main Opposition party is disturbed over NDA Government’s performance because this Government has carried out defence deals without involving people like Quattrocchi or Michel. “Congress’ history in defence deals is involvement of people like mama Quattrocchi or Christian Michel who was recently brought to the country,” Modi said while addressing a public meeting in Rae Bareli, the Parliamentary constituency of UPA chairperson Sonia. Earlier, Modi flagged off the new rake of rail coaches and dedicated projects worth around Rs 1,100 crore for the district here on Sunday. He also asked why is it that whenever Congress makes attack on the Indian Army, people from the across the border in Pakistan clap and why they appreciate the country’s oldest party. “During UPA rule foreigners played a pivotal role in defence deal. Today there are two sides. On one side is the government that is trying to strengthen our defence forces while on the other is the forces trying to weaken forces at any cost. Congress is standing with those who do not want to strengthen our forces,” he said. He attacked Congress and other opposition parties that raise questions on surgical strikes.”They trust enemy more than our Army. What can be expected of them?” PM said. Modi also attacked Congress over Rafale deal and quoted a verse of Ram Charit Manas which says that truth prevails. “People tried to spread lies for personal gains but you know truth always stays while lies have short shelf life,” he said. Modi also made an indirect attack on Congress president Rahul Gandhi saying “some people love to live with lies. Some people have made this the guiding principal in their life. For such leader everyone from armed forces officer to Raksha Mantri and now even Supreme Court is a lier”. “Country will neither forget nor forgive previous Government’s attitude towards our Army. For us, the country comes first and not the party,” Modi said. The PM also ridiculed the farm loan waiver of the Congress during the Assembly polls in five States and alleged that in Karnataka Congress has failed to deliver promise and now the farmers’ unrest is intensifying. “The Congress didn’t fulfill its promise to Karnataka farmers. They promised loan waivers, but according to a recent report, not even 1000 farmers got this benefit in over 6 months,” he said. He also blamed the previous UPA Governments of not implementing the Swaminathan report. “We had implemented the said report and are paying Rs 60,000 crore as remunerative price of 22 crops to the farmers,” he added. He ripped apart Congress party for ignoring development in Rae Bareli. “The Central Government is committed to the development of Rae Bareli. But, earlier Governments neglected it. We have just only ideology to follow whether it is the Centre or the State BJP Government, that is Saabka Saath , Saabka Vikas,” he said. During his over one hour long speech, the PM had to stop for a moment when some youths were raising slogans from the front. 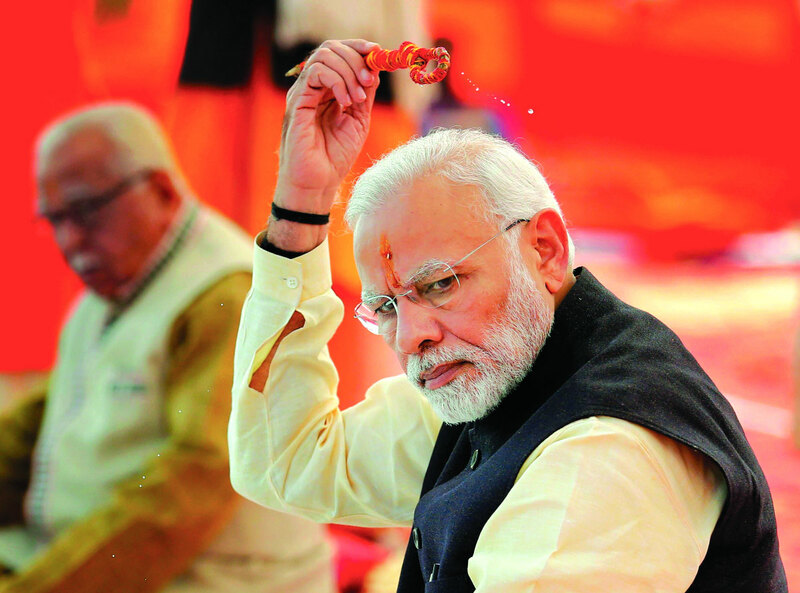 Later, addressing another public gathering in the pilgrim town of Prayagraj, the new name of Allahabad, ahead of the Kumbh Mela beginning Jaunary 15, the PM charged the Congress of building pressure on the judiciary and urged the people to remain wary of such a party. Modi alleged that the grand old party which has ruled the country for the longest period of time has tried to “influence” the judiciary. “The party which had ruled the country for the longest period of time had always considered itself above the law, the judiciary, and even above the country. Every institution of the country that had refused to toe its line, or work as per its orders or bow before it has been destroyed,” the Prime Minister alleged. Modi added that it is because of this “attitude” that efforts were made to “weaken” the judicial system. “There is only one reason. The judiciary was among those institutions which stood against the corrupt and anarchic antics of the party,” Modi said. Vice President Venkaiah Naidu had rejected the ‘impeachment notice’ in which the Opposition parties had accused the then CJI of five counts of “misbehaviour” and “misusing” authority. “It has been proved that they consider themselves above the country, democracy, judiciary and even the people. A couple of days ago, we have seen an example,” Modi said, in an apparent reference to the Supreme Court dismissing a batch of petitions seeking a probe into the Rafale deal.